Beth Rifkin has been writing health- and fitness-related articles since 2005. Her bylines include "Tennis Life," "Ms. Fitness," "Triathlon Magazine," "Inside Tennis" and others. She holds a Bachelor of Business Administration from Temple University. Combining an egg with oatmeal creates a powerhouse breakfast. 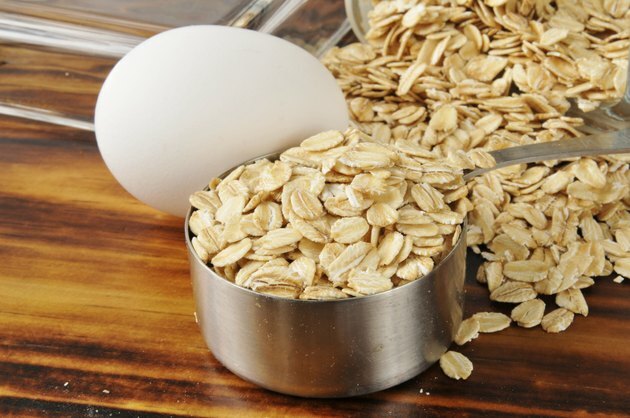 In addition to the vitamins and minerals in both foods, oatmeal provides you with 4 grams of fiber and whole grain, while the egg provides 6.26 grams of protein. The combination of protein and fiber make you feel fuller, longer, which helps in maintaining your weight. When prepared correctly, the egg can add a creamy texture to the oatmeal. However, the trick is to make sure that the egg is cooked all the way to avoid any food-borne illnesses; warming the egg first solves that problem. Fill a bowl with hot water and place the egg, in its shell, in the water for 30 to 60 seconds. Measure 1/2 a cup of oats and 1 cup of water and pour them into a pot. Crack the egg into the pot and stir well to mix the egg, oatmeal and water. Bring the oatmeal to a boil over high heat. Reduce the temperature to simmer. Stir the oatmeal frequently while cooking. Quick oats can take 2 to 3 minutes to cook, while old-fashioned oats can take twice as long. Transfer the oatmeal to a bowl when it has reached the desired consistency. Top your oatmeal with cinnamon, honey, milk and walnuts for a tasty and complete breakfast. You can also make oatmeal with an egg in the microwave; combine the warmed egg, oatmeal and water in a bowl and cook on high for 3 minutes.